Hello again! Seems like that hour just flew by quicker than the lovely Ingrid Michaelson Old Navy ditty does, am I right? 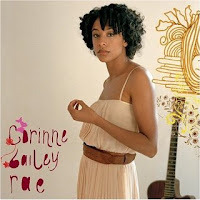 Well, for the second of Vertigo Shtick's 24 Songs for V-Day, I thought I'd serenade the L.A. bar patrons as they make their way home (or to the next after-party) with a rousing soul ballad from Corinne Bailey Rae's debut album. Mmm, yessir, I've always thought this to be her sexiest song by far; I love the horns in the chorus, and the way the typically demure-voiced singer really brings out a bit of old fashioned lusty growl. Interestingly, this song was released as a single in the US only, and although not promoted by EMI it spent twelve weeks on the Hot Hip Hop/R&B Songs chart, peaking at number 70.